This article was originally published by Torque Magazine, and is reproduced here with permission. Starting completely from scratch when developing themes naturally means you’re free to do anything you’d like. This opens up plenty of room for creative freedom, but getting started can take up a lot of time. Many of the initial tasks you’ll carry out are necessary, yet time-intensive. The good news is that WordPress “starter” themes or frameworks (also called “blank” themes) can do some of the initial heavy lifting for you. This is because they include foundational base code for you to work from. They can help you implement essential functionality, and start you off with some best practices relevant to the task at hand. In this article, we’ll discuss what starter themes are and why they can be so useful. Next, we’ll run through some of the top performers, such as Underscores, FoundationPress, and Bones. Let’s dive in! For the uninitiated, a starter theme — otherwise known as a “blank” theme — provides a basic skeleton you can develop on top of. However, unlike standard WordPress themes, they only include very basic structural code. There’s just enough there to get the theme to work, and let you implement any foundational functionality. They’re also not meant to be used as parent themes themselves, but as the basis for your parent theme. You get a head start on coding the essential foundations of your theme. 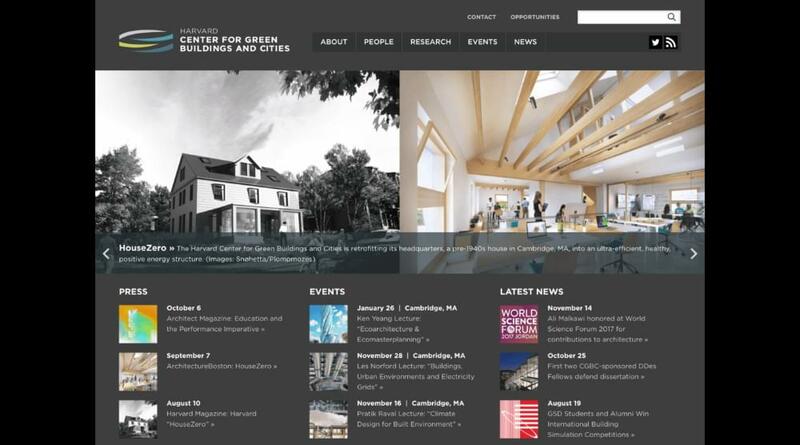 They provide insight into the best practices you’ll want to follow. You have the flexibility to code a custom theme, while still getting a quality base to work from. Of course, no starter theme is perfect, and you’ll need to consider a few things before deciding whether it’s worth using one. For example, you’ll still be playing by another developer’s rules, and they get to decide what functionality is considered foundational. This means the theme could be packed with snippets that don’t actually help you create the kind of theme you need. In addition, you may still need some time to pick through the code to get a handle on what the theme does out of the box. Of course, starter themes aren’t necessarily ready to roll by default, which can be a confusing concept to grasp at times. All the same, unless you’re working with a particular theme (for example, we’ve seen developers using themes such as Divi and Avada as their base), we think starter themes are an excellent tool for the majority of WordPress developers. If you decide to implement one, the next important question is which to choose. In another article at Torque, we looked briefly at a larger collection of starter themes. However, we’ll now take some of the standout options and examine them more closely. The solutions in the list below are mostly free, but we’ll clearly mention when there’s a price involved. Let’s start with a theme that definitely has the WordPress seal of approval. Underscores is arguably the best-known starter theme available. It’s developed and maintained by Automattic (i.e. WordPress’ developers), and was originally a fork of the Toolbox theme. 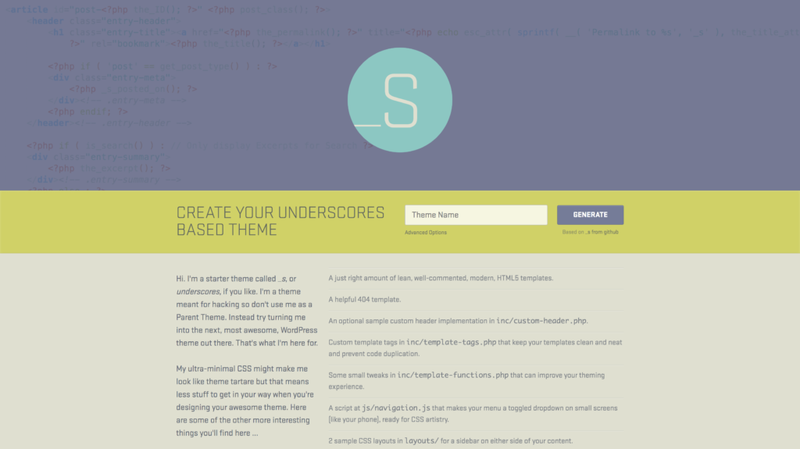 The tagline for Underscores is that it offers you a “1,000-hour head start” when developing themes. Of course, the main selling point here is that you’re getting WordPress’ best practices in one handy package. It’s going to be simple, therefore, to create a valid theme based on WordPress’ requirements. However, unless you have some deft coding chops, it’s also very easy to accidentally create another “me too” WordPress theme. If you’re interested in trying out Underscores, we previously published The Beginner’s Guide to Creating a Theme With Underscores, which does exactly what it says on the box. You may also want to look at the WordPress Theme Development Guide, as this will also show you how the code is structured at a base level. Next up, FoundationPress is an open-source starter theme built on Foundation 6, which uses Sass and Grunt. It was released in 2013, continues to be regularly updated by a community of developers, and is billed as the “most advanced mobile-first framework in the world”. This theme is ideal if you’re looking to develop for business-specific purposes. On the flip side, that means there aren’t as many themes you can download to get a feel for how FoundationPress is used in the “real-world”. Your best bet is to take a look at the Kitchen Sink template, and read through the theme’s thorough documentation. Bones is another free, mobile-first starter theme with built-in Sass integration. However, the primary focus here is on speed. 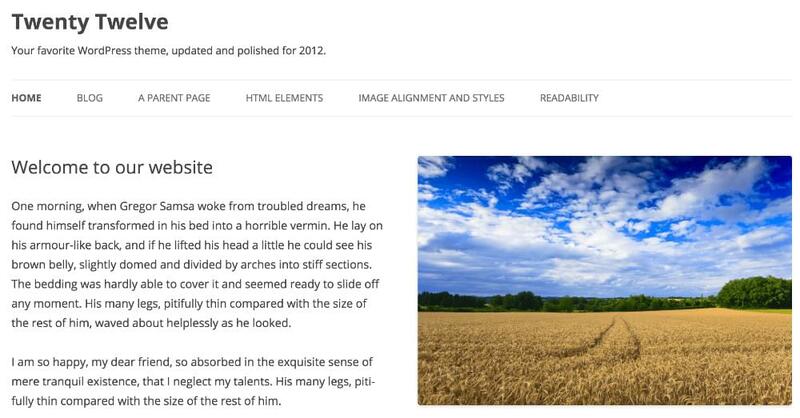 For example, Bones comes with a light header out of the box, which is in contrast to many other WordPress starter themes. What’s more, it gives you a “leg-up” when getting to know its inner workings. That’s because Bones comes pre-loaded with custom dashboard functions and post types, so you can see how they work by default. While ease of use is a perk of Bones, this also presents some drawbacks. Given the amount of helpful code included by default, more experienced users of the theme may be annoyed at having to strip away all the elements they don’t need. There’s also no showcase available, which makes it difficult to determine how Bones will translate into a real-world theme. Even so, following a decent tutorial can help you have a working theme ready in a flash. Getting hands-on immediately is never a bad thing when it comes to a new tool, and Bones makes it very simple to do that. For our penultimate theme, we’re going off the beaten track to look at a “framework” — more specifically, the Genesis Framework. This is the only premium solution on our list (with plans starting at $60), and it requires you to develop using child themes rather than editing the framework directly. Even so, it’s probably the most developer-friendly theme on this list. Plus, it uses WordPress’ hooks to assist you in creating your themes. Without a doubt, the wealth of resources and documentation available is a stand-out benefit of Genesis. Developers such as Carrie Dils are well experienced with the framework, and her Lynda portfolio contains a number of Genesis-specific courses worth checking out. However, there is a cost involved. Also, the need to develop child themes for use with the framework can translate into extra hassle that a client may not want. As we mentioned, Carrie Dils is the go-to Genesis queen. As far as we’re concerned, her courses on Learning Genesis for WordPress and WordPress and Genesis: Building Child Themes From Scratch can be considered the “gospel” for developing with this framework. Unfortunately, much like some of the other starter themes on this list, HTML5 Blank doesn’t have a showcase. So finding real-world success stories can be tough. However, the theme does follow WordPress’ coding standards, and the GitHub profile contains plenty to sink your teeth into when beginning your development. HTML5 Blank is the only theme on this list to have little third-party documentation available on how to get started with it. That’s a shame, because it has a lot of support and can be an excellent tool. If you’re a beginner to starter themes, however, you may need to look elsewhere to get your feet wet. Using WordPress starter themes in your workflow can help you create a ready-to-go WordPress theme in less time than if you started completely from scratch. For this reason, they should be a go-to development tool, regardless of your expertise. Underscores: Automattic’s offering is a great option, regardless of your initial expertise. 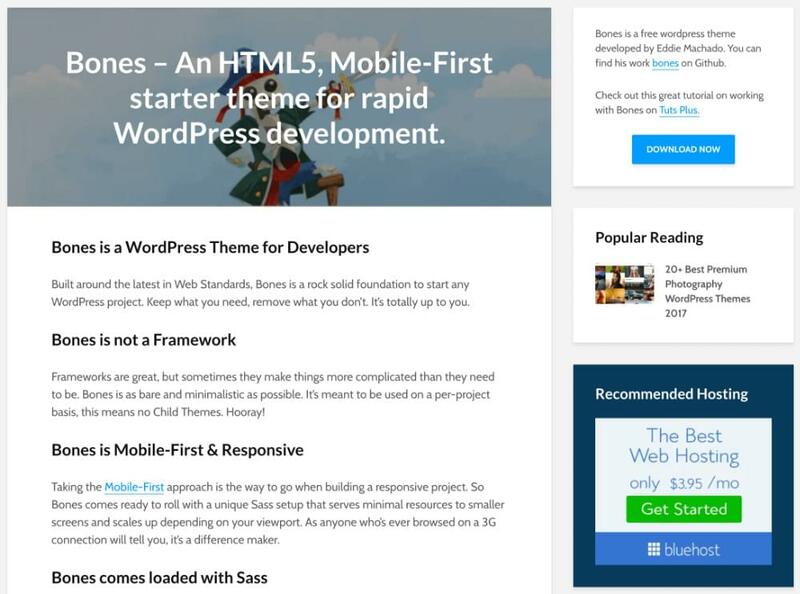 FoundationPress: This is a mobile-friendly, open-source starter theme that’s great when creating custom themes for specific purposes. Bones: This is arguably the best beginner theme on the list, given the wealth of handy tips and advice it provides. 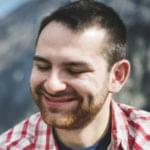 Genesis: The only premium option here, this framework has the backing some of WordPress’ biggest names. 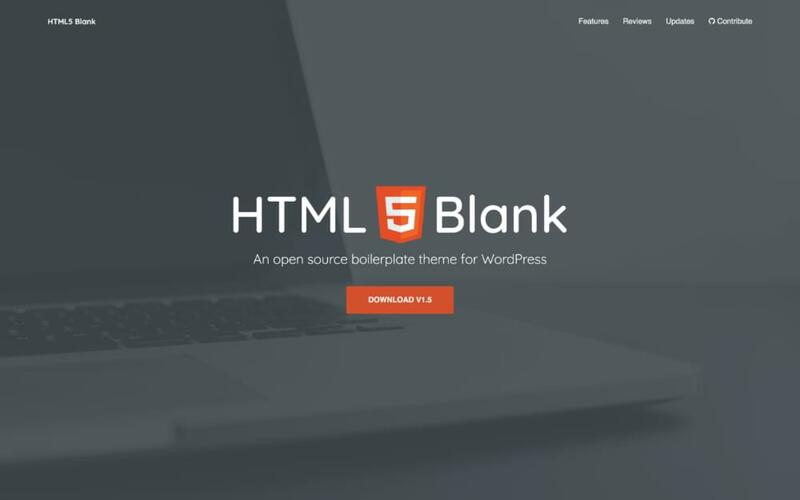 HTML5 Blank: Finally, this is a bare-bones starter theme that will help translate standard HTML into WordPress-friendly code. Do you have any questions about how to use starter themes, or have a suggestion for one we’ve missed? Let us know in the comments section below!